The latest Bitcoin crash has some investors believing the “end of days” are near. Once bullish “hodlers” and committed individuals now voice their concerns and fears that this crash indicates that the cryptocurrency market may be faced with a new normal. While the latest crash has been painful, it is best to step back and assess the current state of Bitcoin relative to its past. 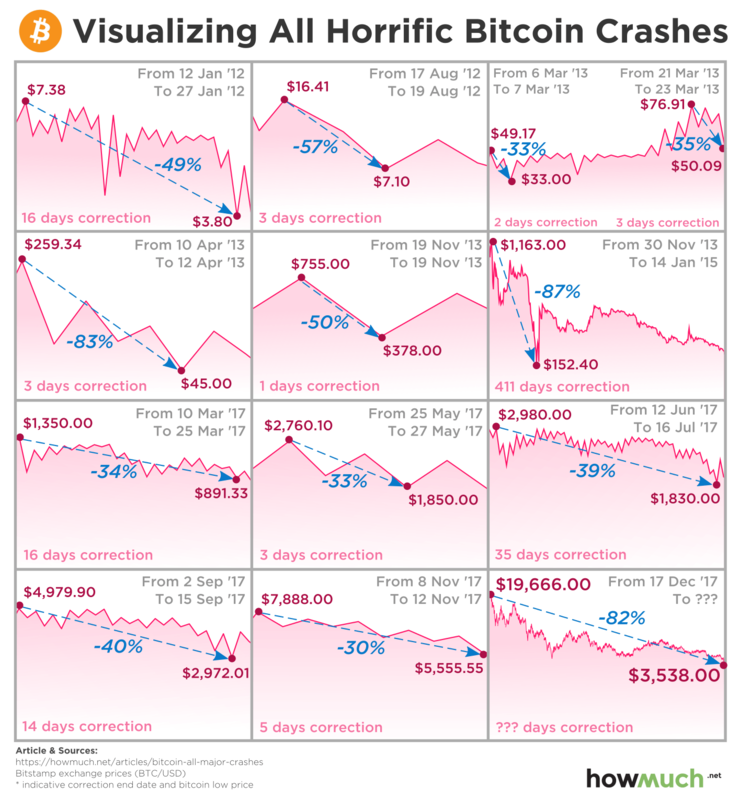 Bitcoin has “crashed” many times over the past several years, but how does this latest downturn compare to past steep sell offs? In order to compare the most recent Bitcoin crash to other past panics, we decided to create a visual that clearly shows twelve other times that the top cryptocurrency has sold off. Each box represents a specific time period in which the price of Bitcoin came under extreme selling pressure. Using the BitStamp Bitcoin-to-U.S.-Dollar (BTC/USD) pair, our team found the specific highs and lows of the past crashes dating back to January 2012. Utilizing a blue arrow, we highlight the percentage of value lost during each sell off. Lastly, we measured the length of each specific crash period by stating the number of days the correction ultimately lasted. The latest correction took place between December 17, 2017 and February 6, 2018, or 48 days, in which 70% of Bitcoin value was lost. However, if you look at the period between April 10, 2013 and April 12, 2013, Bitcoin lost an astounding 83% of its value over a three-day period. Talk about a panic! The point is that crashes have become relatively common throughout the cryptocurrency market, which is known for its swift volatility. It is important to turn to data and the facts in times of turmoil, rather than relying on one’s emotions. Overall, the latest correction in the price of Bitcoin is nothing out of the ordinary. History shows that the top cryptocurrency has sustained much more rapid losses during a shorter period of time over the course of the past several years, yet it has not discouraged long-term investors. Regulatory crackdown fears seem to be main source of the latest crash, but the recent cryptocurrency regulatory hearing before the U.S. Senate struck a much brighter tone than crypto traders had anticipated. This shows that fears of regulators attempting to shut down the cryptocurrency market are overblown. In the end, cryptocurrency is still a very relatively new concept that will have its highs and lows, but its resilience in the face of uncertainty has been nothing short of incredible.